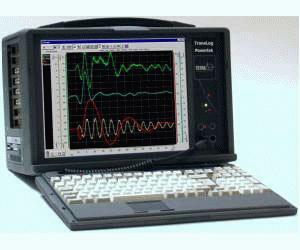 The TransLog is a notebook size high speed transient data recorder, containing up to 8 channels. TransLog has a wide range of uses, especially in data logging applications where many signals must be examined and recorded simultaneously. Often triggering from one or more of its inputs, TransLog makes it possible to capture fast transient events that would normally be missed. High resolution and large memory ensures that events can be recorded accurately over long periods and magnified as required. Multiple cursors and colour traces, allows the user quick and easy analysis in terms of time and amplitude. Long pre-trigger and post-trigger memory allows detailed examination of events before and after the main trigger, ensuring measurement data is not lost. A large 14.1" TFT screen ensures clear viewing without connecting to an external display or PC. Recorder mode offers direct storage to hard disk at rates of 15MHz. Data can be stored in a number ways and the storage capability is enhanced using 100Mbit Ethernet or USB 2 interfaces.